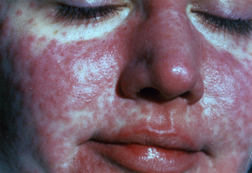 Measles, also known as rubeola, is an infection, mainly of the nose, windpipe and lungs that is very contagious, meaning it spreads easily from person to person. The measles virus usually spreads when someone comes into contact with droplets from another person that contain the virus. This can happen when someone with the virus coughs or sneezes. It also can happen when people touch used tissues, share drinking glasses or touch hands that have infected droplets on them. Once the virus gets into the body, the infection spreads throughout the nose, windpipe and lungs, into the skin and other body organs.